We grew up on Soup Beans and Cornbread. You might also call them Pinto Beans and Cornbread. Anyway you call it, it's a cheap eat and very filling for your family. Growing up, we had some very "lean" times. During these times, my Momma would always make a big pot of Soup Beans. We could eat several meals from just one pot. We didn't always have a "meat" to put in the pot, but it always tasted great! Add the ham bone (or your choice of meat), bay leaves and salt and bring the pot of beans back to a boil and simmer over low heat for 1-2 hours. Check the doneness of the beans after one hour to see if they are soft enough, if not, continue cooking to your liking. We always serve Soup Beans with a pone of cornbread. This is cornbread baked in a round cast iron skillet not in a square baking dish. And our cornbread is not sweet. To make the cornbread, I use a packaged cornmeal mix from the store. Heat a cast iron skillet over medium heat on the stove top. Add the recommended amount of fat or oil from the package directions to the skillet to get it hot. Mix up the cornmeal mix according to the package directions and add the hot oil to the bowl, leaving about 1 or 2 tablespoons of hot oil in the cast iron skillet. Mix up the cornmeal mix and pour into the hot skillet. Allow it to sit on the stove top for about 1-2 minutes (you might start to see little bubbles come to surface, that means it's ready for the oven) and then finish baking it in the preheated oven. When it's done, flip it out onto a plate and enjoy. 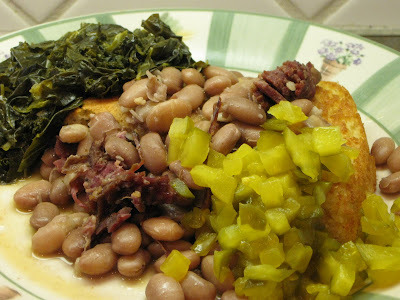 I also like to serve chow-chow (a relish that reminds me of bread and butter pickles, usually consisting of cucumbers, onions, peppers and sometimes cabbage) with the pinto beans, collards and big slice of cornbread on the side. This makes me miss my Grandma Wilson. I think I'll get out her 75 year old seasoned cast-iron skillet and make a pone of cornbread! Funny!! We are eating this tonight!! My favorite all time dinner. We also add fried taters for a side sometimes. This looks great! I think I might try to make this next week - simple is yummy! Thanks!! I am always looking for new bean recipes. Your pics are great! I can't seem to make mine look good. Growing up in WV, I ate these all the time, but when my grandfather died, the recipe for soup beans disappeared. Thanks for this posting, and for keeping all of the old favorites alive!